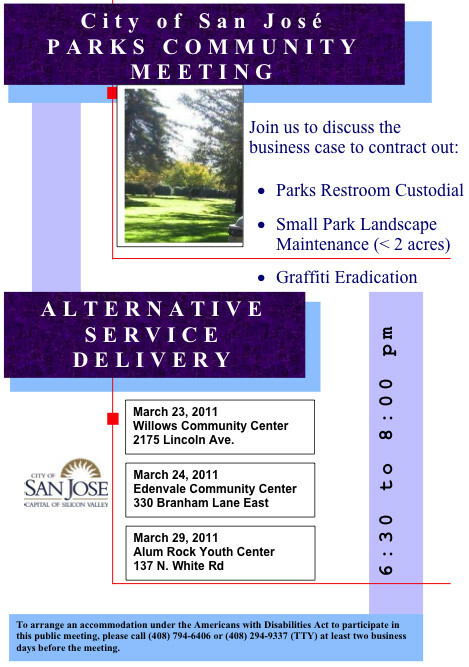 On behalf of Steve Hammack, Deputy Director of Parks, Recreation and Neighborhood Services, you are invited to attend one of three community meetings to be held to discuss the business case for alternative service delivery options for small park landscape maintenance, graffiti eradication and park restroom custodial services. The Parks Division is seeking input from the community to determine whether to include the proposals as part of the 2011-2012 Proposed Budget in accordance with Council Policy 0-41. At this time, the Department is undertaking a business case analysis to evaluate service delivery changes in order to develop a recommendation to the City Council. For more information, please contact Suzanne Wolf at 794-6406 if you have any additional questions or comments.